The first shipload of emigrants from Norway departed from Stavanger in 1825, and landed in the port of New York after a lengthy voyage across the Atlantic. In the following years new loads of emigrants followed. Most of these early emigrant ships disembarked the passengers at the port of New York. The great majority of these early Norwegian immigrants traveled as steerage passengers on sailing ships. However, from about 1853 the tide changed, and most Norwegian emigrant ships disembarked the passengers at the Canadian port of Quebec. When the great foreign steamship companies took over the conveyance of Norwegian emigrants (1865-1870), New York again became the main debarkation point for the majority of the Norwegian emigrants. If your ancestors were among those emigrating before 1853, you should have a good chance of finding them on a passenger list to New York or another US port. The Canadians did not begin the archiving of passenger lists before 1865 (for the port of Quebec). Norwegian records of emigrants did not start until 1867. This means that for the majority of Norwegian emigrants leaving from 1853 up to 1865, there are no surviving passenger lists. Many of these emigrants might be listed in police passport lists and in Norwegian parish lists, but these do usually not give any information about what ships they traveled on. In the Norway Heritage database we have been able to reconstruct some of the missing information from other sources then what are found in the Canadian archives. There was a direct steamship connection between Norway and New York between 1871 and 1875 - total passengers conveyed on that line was 8622. Emigrants started to travel indirectly by steamship in the late 1860's, numbers increased every year. By 1874 all the Norwegian emigrants bound for North America traveled by steamship. The great British, German and American steamship companies did in general not sail from Norwegian ports. Emigrants traveling with the great steamship companies had to travel via another port as transmigrants. The majority of the Norwegians traveled via ports in Britain, but many also went by the German ports of Bremen and Hamburg, and a smaller number by Antwerp in Holland. Norwegian emigrants traveling via Britain mainly went via the port of Hull, then from Hull to Liverpool or Glasgow by train. This means that they would not arrive in America on the same ship on which they departed Norway. Exceptions: Passengers traveling on the Norwegian American Steamship Co. between 1871 and 1875, and passengers traveling with the Thingvalla Line (service began in 1882), later the Scandinavian America Line to New York. From 1913 the Norwegian America Line started a regular service directly from Norway to New York. For emigrants traveling directly from Norway to North America after 1866 you can find registers or passenger lists both in Norway (by the police) and at the debarkation port. For emigrants traveling via Britain after 1866, there were lists created in Norway (by the police), in Britain (by The British Board of Trade available from 1890), and at the debarkation port in the US or Canada. All regular emigrants were registered by the Norwegian Police starting in May 1867. We often speak of those records as the "emigration protocols". However, there were also many irregular emigrants, such as sailors jumping ship. It is possible to find information about those in the Norwegian sailors records, they will not appear on any passenger lists. When comparing the lists generated in the embarkation port in Norway, with those generated in Britain and in the debarkation ports, it is surprising to find great variations in the way names were recorded and in other given information. One must keep in mind that the different lists were not created with genealogical research in mind, but for other purposes. Even so, they are now valuable sources for genealogists and historians. If you have been wondering where to start looking for information about your Norwegian emigrant ancestors, you will find some answers to that here. We will try to give an overview of the different sources available. We will discuss what information you should expect to find, and where to find it. We will try to give an introduction to the main sources from where you can trace information about Norwegian emigrants. There is a variety of different other records you could use in your genealogy research, so note that the sources discussed in this article are only those connected to the voyage. What is special about them is that they represents the link between the old and the new country, they can be found on both sides of the ocean. Records were often constructed on different stages of the voyage, as the emigrant left the old country, on the voyage, and as the immigrant entered the new country. They were all different, and the content of the lists varies greatly. The richness of the sources them selves also varies a lot within the time frame we are focusing on, which is 1825 - 1925. Below is a diagram showing the most important records. 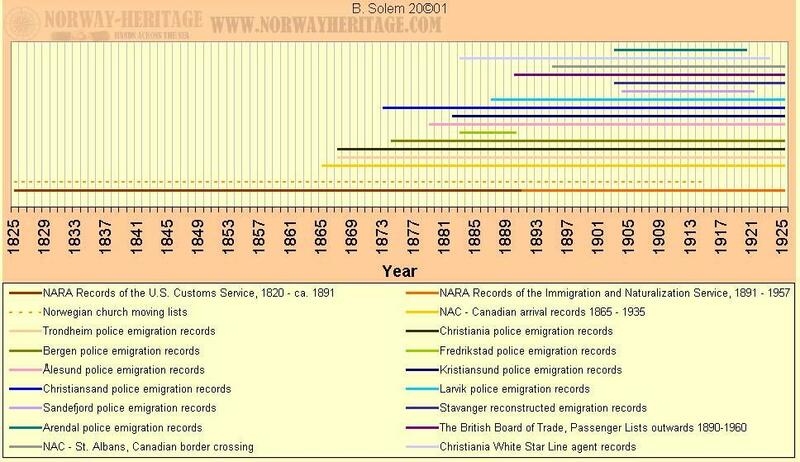 This diagram shows the most important records to tracing the emigration of Norwegian emigrants. There were also a few other records that are significant, which are not included in the time line. They were the Norwegian police passport records, the Maritime inscription - registers of seamen, and the American naturalization records. Note that the Norwegian moving registers kept by the ministers in the different parishes, from where people emigrated, have many lacunas and were not used with the same intensity thorough all times and on all places. The kind of information we can hope to find in the various records are depending on what the purpose were for keeping them. The compilers would only include the necessary information needed in order to serve the purpose, they were not making them just for fun. It is therefore of great value to researchers to have knowledge about why records were constructed.